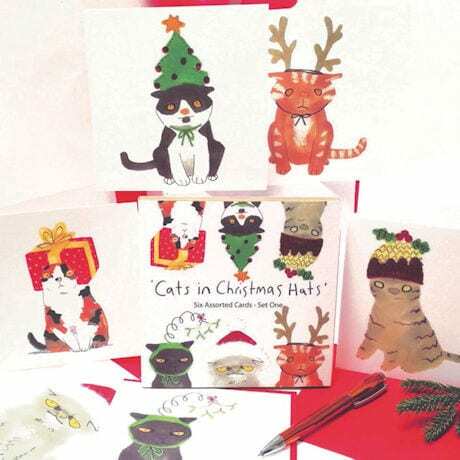 A fluffy kitten topped with a Santa hat, a woebegone marmalade cat in reindeer antlers, a wide-eyed calico wearing a gift-wrapped package… Each purrfectly absurd 5¾"-square note card in this whimsical set will have cat lovers giggling even before they read your handwritten greetings inside. Created by Cambridge, UK-based illustrator Jo Clark, our Cats in Christmas Hats Cards will deliver ample holiday cheer—and a few belly laughs! Boxed set of six cards (one of each design) includes coordinating red envelopes.